204 Osage Circle is located in the west side of Chalfant Valley area just outside of Bishop California. This quite neighborhood is family friendly and you will often see your neighbors out walking or on horse back. This 3 bedroom 2 bathroom split floor plan home sits on 1.13 acres, located at the end of a cul de sac, that backs up to DWP land. This home has an open kitchen with breakfast bar and dining area. The living room has a pellet stove to keep you warm during the cold winter nights. A 3 car garage gives you plenty of room for parking and workshop area. 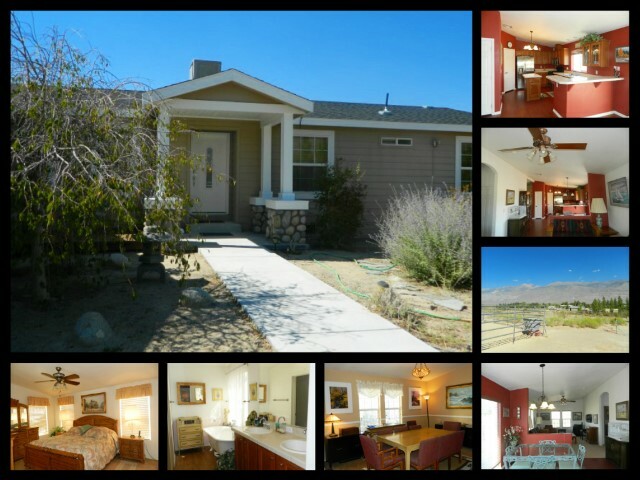 This property has views of the White Mountain and Sierra Nevada Mountain Ranges from the front patio and back deck. The fully fenced backyard has a deck area with an unobstructed view of the Sierra Nevada Mountain Range. This property includes a fenced in fruit orchard, room for a horse corral area (zoned for horses) or out buildings. This property is located out of the flood zone and qualifies for USDA loans. The Chalfant Valley area is located approximately ten miles north of Bishop, CA on Highway 6. You’ll enjoy marvelous, endless views and spectacular sunsets surrounding the White Mountains and the Sierra Nevada Range. Surrounded by public land, this neighborhood is peaceful and serene.